Audre Lorde’s powerful words: ‘Caring for myself is not self-indulgence, it is self-preservation, and that is an act of political warfare’ remain revolutionary. Her call for self-care could not be more relevant today. Not only does Audre Lorde give women particularly, marginalised women, permission to care for themselves, she makes it a political imperative. Audre Lorde brilliantly highlights the socio-political context of our lived experience as marginalised women by locating our survival and welfare within the struggle for liberation. To me her statement reads as her holding two fingers up at the status quo which continues to devalue marginalised lives and bodies and, shames us into doing the same. Shame can be a painful emotion which breeds feelings of worthlessness. It is that imposed worthlessness which lays deep inside us, often silent and unacknowledged, that Audre Lorde hits directly at. This is why I believe her words resonate so deeply for so many of us. Shame is strongly correlated with emotional distress, a range of psychological problems including depressive, anxiety, eating and personality difficulties. It can cause people to loathe themselves and question their value as a human beings. Further, because shame shames people into hiding their feelings of shame, it is isolating. For marginalised people experiencing shame is often an everyday experience. Quite distinctively though, they often experience shame over things that define their identity. In other words, marginalised individuals feel shame because of their otherness. Marginalised shame is a by-product of power structures and social hierarchies, which place oppressed groups last in the pecking order. Thus, it is a form of ‘social shame’. Howard (1995) suggests that as a result of being systematically dishonoured and degraded, women and racial minorities must adapt to fit into a white, male dominated society and consequently learn to become ashamed of themselves. This is the crux, I would argue, of marginalised shame which may be defined as feelings of inadequacy people from marginalised groups experience because they differ from the dominant group. Initially, Freud saw shame rather than anxiety as the central hidden feeling leading to the formation and maintenance of psychopathology, according to him, shame led to repression and hysteria. Unsurprisingly, many of us have come to believe that experiencing shame excessively, is a manifestation of some sort of psychological flaw. There is a long history within psychology of looking at the effect(s) of early experiences on the psychological, and social development of people and/or of focusing on cognitive or other intra-psychic deficiencies, in therapy. For example, cognitive behavioural therapy for shame-based difficulties will aim to highlight the ‘dysfunctional’ beliefs clients hold about the world and themselves and which are thought to be maintained by faulty reasoning such as unduly sinister predictions, self-doubt about coping skills and/or rigid rules for living. Thus, a CBT shame-based intervention may aim to help clients see their thoughts as mental events which may be objectively evaluated and replaced with more ‘accurate’ cognitions. Compassion Focussed Therapy (CFT), (Gilbert, 2005) is based on the premise that people who experience high levels of shame and self-criticism, tend to have difficulty experiencing reassurance and safeness because the neural system that activates such feelings – referred to as the soothing system in CFT – is underdeveloped. This is believed to be due to early exposure to threatening or risky environments/events. CFT interventions therefore focus on increasing clients’ compassionate skills and attributes and on decreasing their self-criticalness and shame, emotions that are believed to have come to be used to manage psychological pain for such individuals. Clinically thus, shame has largely been formulated as an individual process. Needless to say, its formulations have remained apolitical and removed from the lived experience of marginalised groups. Even when social influences have been included, some form of individual pathology is usually posited. Additionally, the intersubjective aspects of shame and their function in the social world are rarely examined. However, more than simply being an individual pathology, shame is a powerful tool of social control which serves the interests of dominant groups. Indeed, it is not coincidental that all marginalised groups typically experience more feelings of shame. Feeling inadequate reinforces the dominant group’s norms and ideas of beauty, ability, sexual orientation, wellbeing… and the subjugation of those who do not or cannot adhere to them. Social shame is probably as effective as material deprivation, social dislocation or civil disempowerment in keeping marginalised people in their place. It makes the latter hesitate and/or refrain from claiming their rights to dignity, equal treatment and full humanity. Essentially, it makes marginalised people do the ‘master‘s work’ by becoming subservient and thus inadvertently complicit in systems of devaluation and degradation. For example, rather than calling out those who show little or no effort in pronouncing (some) ‘foreign’ names, we change ours or become ashamed of them. Instead of calling out white supremacy for the benefit it affords to those with lighter skin, many of us resort to whitening ours or replicate the degradation of people who are darker. Intersubjectivity has been missing from most shame conceptualisations. This is an important oversight. Intersubjectivity invites us to consider all actions and interactions contexually and relationally. In that sense, the mental life of marginalised groups cannot be considered separately from the mental life of socially privileged groups. Rather, mental events and experiences are co-created and continually mutually influenced by each group’s processes. Social shame cannot thus be formulated as a distinct, separate or isolated experience ‘belonging’ to the psyche of those who are oppressed/marginalised. Figure a. above provides a basic working model of a socially grounded interesujective formulation of (social) shame. It addresses both privileged and oppressed groups’ subjectivity and contributions not only to social shame but also to their respective behaviours and potential psychological structures. The model aims to shift from conceptualisations of shame as an individual psychopathology to a more socially located and relational formulation which may be more relevant to the social realities of marginalised groups. The diagram which sits on the social context, is based upon two (implicit) axes represented by two triangles. The triangles symbolise marginalised and privileged group’s belief-behaviour patterns sanctioned by the social context. Both axes feed into social shame and get into intersubjective contact. The model posits that it is this intersubjectivity which maintains social shame and gives it potency. For the privileged, social shame results in the internalisation of a sense of contempt and superiority over the marginalised upon which oppressive acts are based. It is important to note that oppressive acts may be carried out implicitly and outside the conscious awareness of those with social power. Further, the model proposes, on the marginalised axe, that oppressive behaviours cement feelings of inadequacy and inferiority in the oppressed which in turn lead to subserving behaviours. Again such behaviours may be enacted subconsciously. In a vicious cycle, subserving behaviours, reinforce dominant groups sense of contempt and superiority. As the latter remain unchallenged, their privilege is strengthened thus, oppressive behaviours become further legitimised/justified. Some may argue that clinically, the use of the current model may lack utility as it may not directly lead to specific clinical interventions. However, formulation can be a powerful form of intervention and is indeed all that some people need. This may be particularly so for those who have historically been silenced or whose reality has been erased. 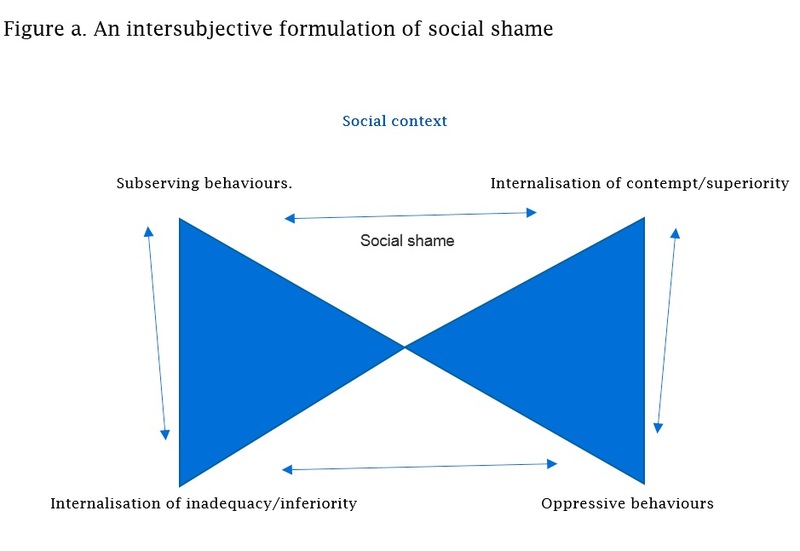 Furthermore, it is important to note that this model is just a starting point to consider intersubjective factors in the formation and maintenance of marginalised shame. It is hoped that the model will generate additional thinking particularly in terms of the interaction between individual and systemic factors in relation to people’s propensity to internalise and enact or indeed resist, socially sanctioned contempt/superiority and inadequacy/inferiority. “For the privileged, social shame results in the internalisation of a sense of contempt and superiority over the marginalised upon which oppressive acts are based. It is important to note that oppressive acts may be carried out implicitly and outside the conscious awareness of those with social power. Further, the model proposes, on the marginalised axe, that oppressive behaviours cement feelings of inadequacy and inferiority in the oppressed which in turn lead to subserving behaviours. Again such behaviours may be enacted subconsciously. In a vicious cycle, subserving behaviours, reinforce dominant groups sense of contempt and superiority. As the latter remain unchallenged, their privilege is strengthened thus, oppressive behaviours become further legitimised/justified. Very well written! Wonderful post! There’s not much I can add to this. This was a great breakdown on social shame. I am always impressed with your writing skills and unique perspective. I always learn something when I visit your blog. Thank you. Typical of the vast numbers of clinical approaches in talking therapies, shame is generally an individualised experience. The location of shame within systems of social constructions of power, privilege and entitlement; a normalised entitlement for some verses a less desirable, deficient, othered, inferior social constuction for the rest requires that ‘normal’ socialisation itself toxifies the intrapsychic space, creating psychological adaptations intrapsychically and thus interpersonally. We can therefore learn to disavow in ourselves and others what is socially rejected; what is commonly called internalised oppression. Conversly our socialisation can positively reinforce and prize us encouraging us to develop a sense of our own superiority with regard to the particular domain in question, for example with regard to race, gender, sexuality, age, physical or psychological functioning. It is interesting that the complementary term ‘internalised privilege’ is never mentioned when discussing internalised oppression, as if one can exist without the other. Shouldn’t this socially defined landscape be included when talking therapists explore shame and shame based systems in clinical training and the therapeutic work? The historical and current formulations of, for example white supremacy and thus racism justified and justify mass global exploitation, torture and murder by those who defined and define themselves as the dominant and entitled group. Cultural subjugation of non white groups has existed for over half a century and continues to be interwoven into the fabric of every social system and is discursively perpetuated. Established power knowledge systems reinforce what we learn about ourselves and others every day; making these social constructions seem normal, natural and expected: until we become aware of this process, thus giving us the power to critically examine, redefine who we are for ourselves, and resist shame based socialisation and social conditioning. Thanks Olukemi for taking the time once more to elaborate some of the issues raised. As always appreciated.